A regional court sentenced a group of gold smugglers to prison terms of up to five years Tuesday, slapping each of the two main culprits with penalties of more than 3 trillion won ($2.67 billion). 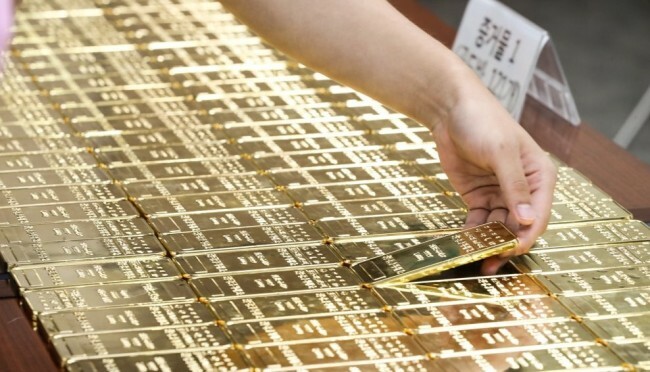 The Busan District Court sentenced the 53-year-old defendant, surnamed Yoon, to five years and a 46-year-old named Yang to 2 1/2 years, finding them guilty of illicitly smuggling 40,000 gold bars, worth over 2 trillion won, from Hong Kong to Japan between July 2015 and December 2016. The court fined them 1.3 trillion won and ordered them to forfeit 2.1 trillion won each. The fines are the largest ever to be slapped on a defendant in a criminal trial. The largest forfeiture on record is the 23 trillion won a court ordered be seized from Kim Woo-Choong, former chairman of now-defunct conglomerate Daewoo Group, who was convicted of accounting fraud and embezzlement in May 2006 and was later pardoned. The defendants in Tuesday's ruling were accused of secretly bringing in the gold bullion from Hong Kong and having Korean travelers deliver it to their accomplices in Japan. They handed the gold bars over to the travelers, whom they had recruited just for delivery, at transits in the Gimhae or Incheon airports. They made more than 40 billion won in profit from the smuggling. Acknowledging most of the charges, the Busan court also sentenced five others to prison terms of up to three years and gave one a suspended jail term, with penalties in ranging from 66.9 billion won to 1.7 trillion won. The eight defendants were fined a combined total of 4.5 trillion won.